A message to all re-sellers. We are both a "direct to end user" AND through re-seller company. As such, we routinely work with companies who use represent us in particular industries or areas. Some of the most common examples of good re-seller relationships which we have are independent parts companies who are searching for an affordable line of decals which they can offer to their existing customers, independent equipment dealers who also offer equipment repair and support and want to be more "full service" in their customer approach, and OEM dealers who want or even need a secondary source for more affordable products to offer their customers. 1. Good level of support. 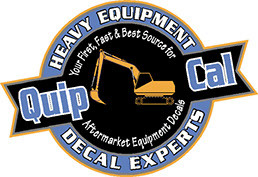 We become your independent decal warehouse. 2. Brown Bag shipping. Only your name will appear on the shipping information. We can also stuff your boxes with your literature upon prior arrangement. Your customers will assume that the decals are coming from your warehouse. We never reach out to or approach your customers directly. You can be sure that your customer is safe in our hands. 3. The ability to gain a fair mark-up and still remain competitively prices with your customer's other sources. 4. Prompt attention to all "Price and Availability" requests, so that you can quote your customers quickly and ensure them a top level of responsive service. 5. The progressive comfort of dealing with a reliable source. You can simply quote and order and know the customer's product will arrive at their shop or office in a timely fashion and will be what they need. That minimizes "after-care" on orders. Show Room and Support Vehicle Graphics. Walk into any OEM equipment dealer's show room or parts area and you'll see some impressive displays. Most newly constructed sales facilities are carefully planned to optimize the "experience" of buying from them. People walk in looking for a $20 part and walk out with new hats, boots, knives, and a real interest in a better lawn mower and a new excavator. Why? It's all in the show room displays and the way those grab attention and create interest. We can help you to enhance the appearance of your parts area or your indoor display area with branded graphics for the floors, walls, counters, and even the windows. If you've already become accustomed to relying on us for your replacement decal needs, then why not take that next step and ask how we can help to make your display areas and parts rooms POP with a great visual experience for your visiting customers. But the need for great graphics doesn't end there. It walks right out the back door and into the service department. From there it moves directly to the fleet of service trucks and parts delivery vehicles you have. And we haven't even talked about the pick ups that your sales people drive. Your fleet can say a lot for you, even when it's stopped at a traffic light or in the parking lot at the little league ball game. Compelling graphics on all of your fleet vehicles can build the confidence of existing customers, while also grabbing the attention of potential ones. Let us help you to get the most from every public exposure mile that your vehicles travel.